Food for Thought, What's New? New non-profit organization helps control stray animal population. Even though I don’t own a dog or cat, the name “SNiP” (which stands for Spay Neuter Program Inc.) causes me to cringe a bit in my inner parts. That’s until I remember how important these simple operations are towards controlling the animal population in the Turks & Caicos Islands. In its first year alone, SNiP conducted 376 surgeries, preventing the birth of a huge number of unwanted puppies and kittens. Happy that the operation went well are Slax and his owner at January’s Spay Day, sponsored by Turkberry. SNiP is one of those serendipitous gatherings of the right people in the right time and place to do a world of good. This independent, not-for-profit organization was launched in early 2017 by a group of volunteers from other local animal welfare organizations who were looking for a better, more effective and humane way of controlling the TCI’s free-roaming animal population. In the past, free spay/neuter clinics were typically conducted yearly, attempting to sterilize as many as 275 animals in a week. SNiP Directors Laurie McCann, Wendy Ayer and Aimee Deziel were involved in these efforts and, while effective, realized that they required massive amounts of organization to secure a location for the surgeries as well as transportation, lodging, food and supplies for the volunteer veterinarians who traveled from abroad. The SNiP directors and many of their volunteers have also volunteered at Potcake Place for years, where unwanted animals are brought to be adopted by residents and visitors. They felt frustration that it was often the same owners bringing in puppies and refusing to sterilize their animals. And although Potcake Place is responsible for the annual adoption of 400 to 500 puppies, statistics show that one unspayed female dog can produce 12 to 20 puppies in one year. In six years, her offspring can produce more than 60,000 dogs! This underscored the importance of starting at the top and sterilizing that one female. Working April’s Spay Day are the Bark & Bliss team and SNiP volunteers (from left): Dr. Meghann Kruck, Lauren Hofland, Auriol Lloyd-Wright, Lisa French, Wendy Ayer, Laurie McCann and Pauline Eden. The need for an ongoing, year-round spay/neuter program was clear. 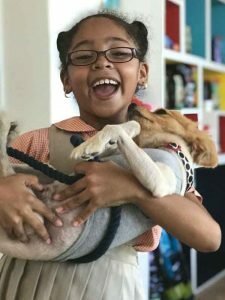 In early 2017, a new animal wellness center—Bark & Bliss—opened in Providenciales, a project backed by SNiP Director Aimee Deziel. Its full-time veterinary team is led by Dr. Meghann Kruck, whose experience includes running a low-income animal clinic in Minneapolis, Minnesota for five years. In fact, Dr. Meghann’s introduction to the Turks & Caicos came as a result of her meeting Susan Blehr and volunteering at the TCSPCA’s spay/neuter clinics. Aimee and Dr. Meghann readily agreed to set aside time and space in the clinic for weekly sterilization operations. Twa Marcelin and Wolf lawyer Erica Krygsman became the fourth director, who handles all legal matters for the NPO. Most owners typically only have to wait one to two weeks maximum for their pet’s operation and, thanks to sponsors and donations the entire process, including drugs administered, is free! With June 21, 2018 marking SNiP’s first anniversary, the group is proud to say that 376 successful surgeries were performed (259 dogs and 117 cats). Pet owners came from around Providenciales, with 65% being Islanders and nearly 1/4 from Blue Hills. The SNiP board of directors lauds the group’s sponsors. Some, such as the Gansevoort Turks + Caicos, sponsor a monthly spay day, which includes the purchase of all the medicines and supplies. Others, including Villa Renaissance, donate old sheets and towels and cash. Some sponsors are condominium owners who are animal lovers and want to give back to the community they so much enjoy. After Hurricanes Irma and Maria hit the TCI in 2017, 14,000 pounds of dog food were donated to feed hungry animals. As SNiP and other volunteers distributed the food, they collected 300 names of pet owners who wanted their animals sterilized. They were pleasantly surprised, understanding that the Caribbean culture (especially men) do not always agree with the procedure, feeling that it undermines an animal’s virility and vitality! SNiP’s efforts in the settlements also occasionally cross into animal welfare territory. Laurie recalls going into Leeward Palms to collect a dog for neutering and finding another dog with a collar deeply embedded in the flesh around its throat. Apparently, the owners had put on the collar when the dog was a puppy but were not able to catch it as it grew. 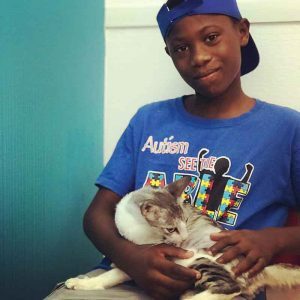 Via Facebook, animal lovers pitched in to help with his medical and ongoing care and his case kickstarted the formation of SNiP’s Angel Fund, to help similar pets in need. Dr. Meghann is a perfect fit for SNiP. Besides being talented, energetic and bubbling with enthusiasm for animals and their owners, she has performed nearly 40,000 sterilizations in her career to date. She is excited to be on-call 24 hours a day and able to provide a continuity of care to pets in the Bark & Bliss full-service clinic. She and Veterinary Technician Lauren Hofland have worked together for many years. Besides their duties on Provo, they regularly travel to Grand Turk, typically seeing as many as 25 animals in a six hour day. Resorts who are SNiP sponsors can take advantage of a new program for stray cats. It involves setting up an on-site feeding station, capturing and sterilizing the cats, then returning them to the resort, where they are likely to guard their food source and keep other strays away. One-year-old Crystal and her owner Marlon took advantage of SNiP’s services in July, 2018. Along with many private donors and a host of hard-working and much-appreciated volunteers, SNiP corporate supporters and sponsors to date are: Gansevoort Turks + Caicos, Turkberry, Grace Bay Resorts, Villa Renaissance, The Palms, The Sands, The Shore Club, Tranquility Property Management, Island Bargains and Save Dog Project. Additional Spay Day sponsorship opportunities are available, with sponsors recognized through social media and ongoing radio ads. For more information, visit www.SNIPTCI.com.